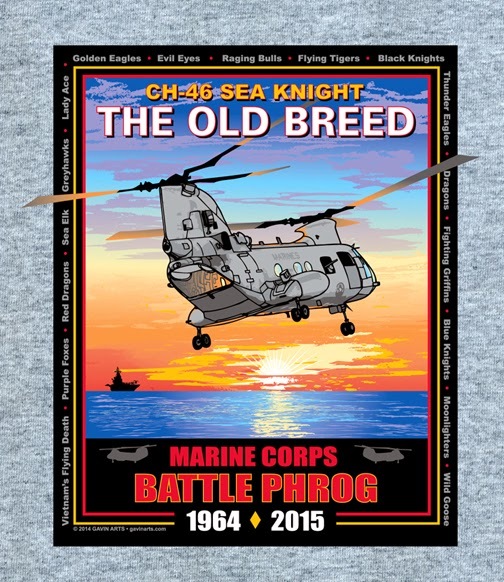 This CH-46 Battle “Phrog” Sea Knight tribute T-Shirt and Poster design by Kimberleigh and Paul Gavin honors the helicopter and its pilots, crews, maintainers and the Marines and cargo they transported in their 51 years of service. The 46 is depicted literally “Flying Off into the Sunset” with “The Old Breed” as the title because the helicopter and all those involved with it share the proud tradition of those Marines who have gone before and flew, lived and died courageously and under indescribable conditions. The project was conceived by the CO of HMMT-164 and the Gavins worked with him and Vietnam era and current pilots and crews. The aircraft will retire from US Marine Corps service in April 2015 when the last 46 squadron, the HMMT-164 “Knightriders” transitions to MV-22 Ospreys. These shirts are available directly through the squadron or they can be mailed if you order from the Gavin’s web site.